In 2011, most of the best meteor showers occurred when the moon was close to full. This natural "light pollution" made the fainter meteors impossible to see. 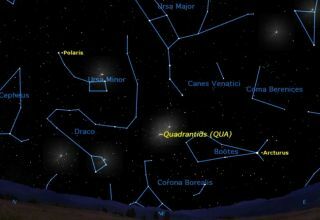 But 2012 starts out with a fine meteor shower, the Quadrantids, with absolutely no moon to interfere with the viewing. The Quadrantid meteor shower will peak on Jan. 4 at about 2 a.m. EST (0700 GMT). Meteor showers occur when the Earth passes through fields of debris left behind by comets or asteroids in the past. The result is that, instead of the handful of meteors, or "shooting stars," which can be seen any clear night, we get a "shower" of meteors: dozens or even hundreds of meteors over the course of an evening. Most meteor showers are named for the constellations in which their "radiants" are located. These are the points in the sky from which the meteors appear to streak. When we look at the radiant of a meteor shower, we are essentially looking up the track upon which the meteors arrive at Earth, just as we would watch a train coming down a railroad track. But after what constellation is the Quadrantid meteor shower named? Strangely enough, it is named for a constellation which no longer exists, Quadrans Muralis, the wall quadrant. This was an instrument used by early astronomers to measure positions in the sky. If you've ever seen a picture of the famous Danish astronomer Tycho Brahe, you've probably seen his wall quadrant. This constellation was named in 1795 by French astronomer Jérôme Lalande, who had a wall quadrant of his own which he decided to immortalize in the sky. Quadrans Muralis consisted of a faint group of stars between the top of Bootes and the handle of the Big Dipper, now completely forgotten except for its survival in the name of this meteor shower. The sky map of the 2012 Quadrantid meteor shower included with this article shows where to look to see the shooting star display. The comet which created this meteor shower has not been identified for certain, but may have been a comet observed in 1490 by Chinese, Korean, and Japanese astronomers. Observing a meteor shower is a naked-eye pursuit. The meteors move too fast to be tracked with telescopes or even binoculars. The best way to observe them is to dress warmly and lie back on a deck chair or chaise longue to get as wide a view of the sky as possible. It’s not necessary to know where the radiant is located, as the meteors can be seen anywhere in the sky. The only important thing is that the radiant be above the horizon. This is not a problem for most observers in North America or Europe since the Quadrantid radiant is circumpolar: it circles the celestial pole and never sets. You will see more meteors after midnight because of the motion of the Earth. Be sure to protect your eyes from direct light and give your eyes plenty of time to adapt to the darkness, at least 20 minutes. You may see nothing for some time, but be patient and the meteors will come. Meteors often come in bunches so, if you see one, watch that area more carefully. If you've never observed meteors before, you may think you’re "seeing things" at first, because they often move very fast, and are gone before you can turn your eyes on them. The Quadrantid shower is unusual for having a very sharp "peak" around 2 a.m. on Jan. 4. Thus it's important to try to observe on this particular date, as the next night will be too late.